Today at uAvionix we are extremely excited to finally announce a new initiative we’ve been keeping under our hats for a while. If you’ve been paying attention, you probably noticed that most of the news over the past 6-12 months about uAvionix has been General Aviation (GA) focused due to the success of our skyBeacon and tailBeacon products. You might be wondering if we’ve lost our focus on unmanned systems. I’m happy to say that we have not! You may have noticed our new tagline at the top of this post “Communicate, Navigate, Separate”. We’ve been known for our “Navigate” and “Separate” capabilities with our GPS and ADS-B solutions, and now we’re excited to venture into the “Communicate” arena. 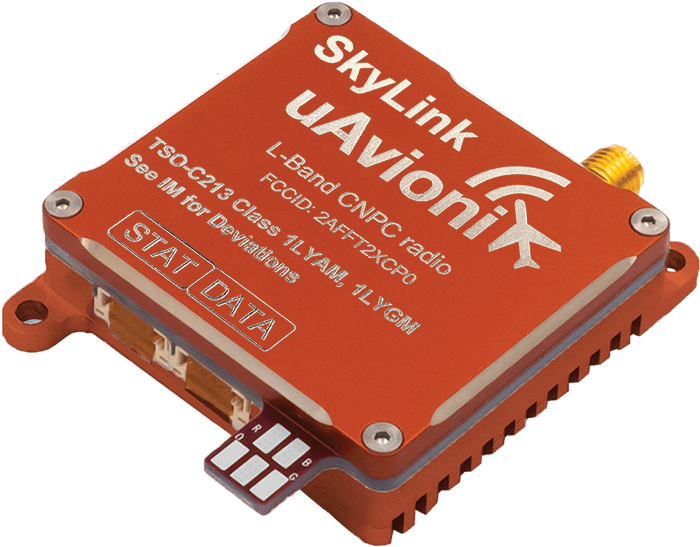 Introducing SkyLink, our new Command and Non-Payload Control (CNPC) Data Link product concept. Off the back of our TSO certification successes, we’re aiming right for the top with SkyLink – targeted to exceed the performance standards of RTCA DO-362 and aimed at a certification under TSO-C-213. We believe that certified CNPC radios are going to become a key component of Beyond Visual Line of Sight (BVLOS) operations and in support of UAS OEM type certification efforts. If you’re familiar with the regulatory development in this area – you’ll know that there are still some standards and spectrum questions being worked out. For that reason, we’re still operating under experimental transmit licenses and with a few select partners for integration and flight testing. What is CNPC and Why is it Important? The robustness of the CNPC data link should be considered in the context of the robustness of the autonomy functions of the autopilot. In other words, if the autopilot’s autonomous functions are non-deterministic, a more robust CNPC data link is required to support control actions. Not only does uAvionix now have TSO certifications under our belt, our team has a personal history with command and control links as well. Prior to founding uAvionix, CEO Paul Beard an our CTO Jeff Walker invented and brought to market the “Spektrum®” digital spread spectrum radio control (RC) technology which revolutionized the RC industry by moving the control link from 27 and 72MHz bands to a high bandwidth 2.4GHz ISM band. We’re looking to bring all of this experience together into SkyLink. Come check it out at AUVSI XPONENTIAL 2019 this year. We’ll be hanging out at booth #4421.